Assemble bed frame to correct width of mattress set. 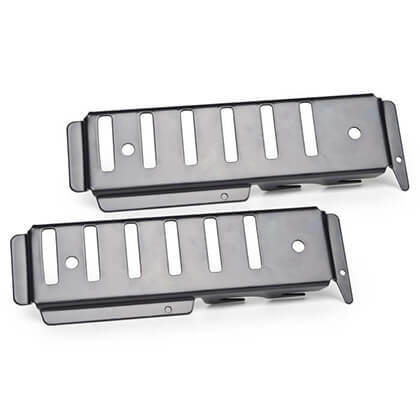 There is a left and a Right Fast’n Up Bracket. Bolt brackets to bed frame (Do not tighten them securely yet) using horizontal slots. Place headboard firmly down on brackets. Now tighten bolts. 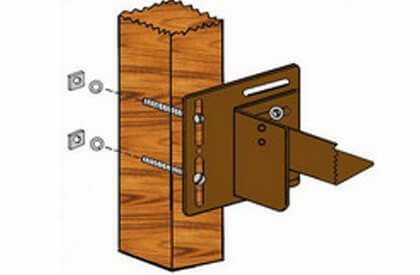 Wood screws may be used to secure brackets to headboard legs. Fits nearly all Twin, full, And Queen headboards having a rail slot in built into the legs. 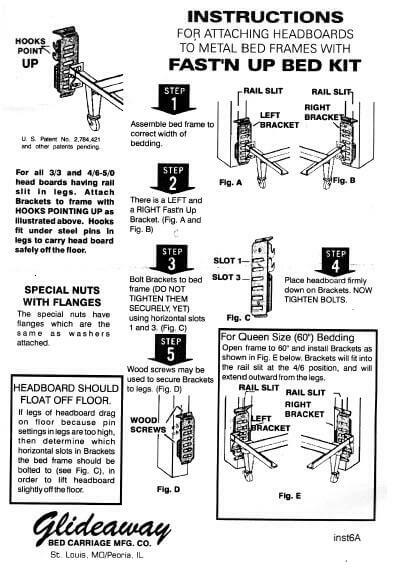 Attach brackets to frame with hooks pointing up. We have this illustrated in the directions photo. Hooks fit under steel pins in legs to lift and carry light weight headboards off the floor. When assembled correctly the headboard should float off floor slightly. If legs of headboard drag on the floor this is because pin setting in legs are set too high. 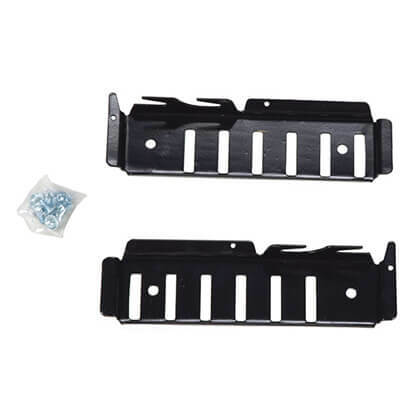 You will need to determine which horizontal slot in the Fasten Up Bed Kit Bracket the bed frame should be bolted to in order to lift the headboard slightly off the floor. NOTE 1: If your headboard is larger and heavier you will want to choose our Down Hooks as a better choice for conversion. 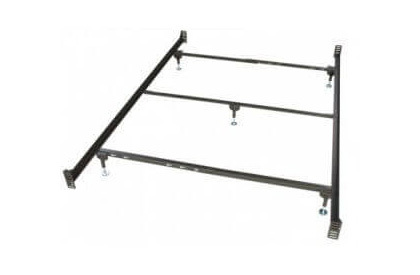 Open frame to 60″ and install brackets as shown in Fig. E in directions photo. Brackets will fit into the rail slit at the full size position and will extend outward from the legs. Love the product. It was well constructed, sturdy and did just what I needed it to do. The staff was knowledgeable and friendly. These were just what we needed. The slats on the bed frame we had are bowed and we already had a metal frame without a head or foot board. So we called and spoke with someone and they made sure from our description that this would most likely fit. When we got them, they fit great and were pretty easy to put on. Now we can use the head board. The product is very sturdy and I’m sure will last forever.